What Are the Benefits of Psyllium Tablets? A plant that’s native to Iran and India, psyllium has been used in traditional medicine to treat skin irritations, bladder problems and high blood pressure. More recently, ingredients in the psyllium husks have been acknowledged to work as treatment for constipation and to help lower cholesterol. Psyllium, which is sometimes known as flea seed or Ispaghula, is a member of the plant family called Plantago. A shrubby plant with white flowers, it produces small brown to reddish-brown seeds that are cultivated for medicinal purposes. The seed of the psyllium plant contains a plant sterol called beta-sitosterol and the husk contains hemicellulose. Beta-sitosterol decreases the amount of cholesterol absorbed from the digestive tract, according to George Mason University. Hemicellulose is insoluble, so it’s not absorbed during digestion. When the husk comes in contact with moisture, it swells into a gelatinous mass that keeps stools hydrated and soft, and adds bulk that stimulates the bowel to contract and move waste through the intestines. The primary use of psyllium is to treat constipation, so it is a common ingredient in over-the-counter bulk laxative products. It may also be prescribed by a physician to treat mild diarrhea or high cholesterol. In 1998, the U.S. Food and Drug Administration reviewed the evidence and determined that fiber from the psyllium seed husk may reduce the risk of heart disease by lowering blood cholesterol. 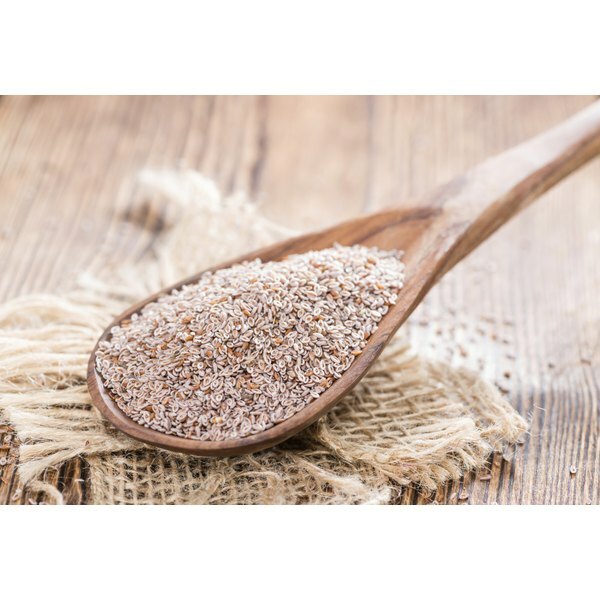 Psyllium may also help treat symptoms in people diagnosed with ulcerative colitis, irritable bowel syndrome and diverticular disease, according to the University of California at San Diego. Any fiber product may cause gas or bloating, but if you experience stomach pain, difficulty breathing or swallowing, rash, itching, nausea or vomiting, call you health care provider immediately. Dry psyllium must be taken with plenty of water. Psyllium may interfere with the absorption of some medications. It should be taken at least 1 hour before or 2-4 hours after other medications. Talk to your physician before using psyllium if you take antidepressants, digoxin, lithium or medications for seizures, diabetes or to lower cholesterol.